There has been some decidely happy mail heading my way recently. First up was this lovely block from Nicky, for the Star of Africa Bee. I asked my Bee Mates to make a block on the theme of houses, and Nicky came up with this wonderful representation of Eilean Donan Castle for me. Didn't she do a fantastic job on this block? The Castle sits at a point in Scotland where three sea lochs meet, and I think Nicky has captured the iconic image so well. 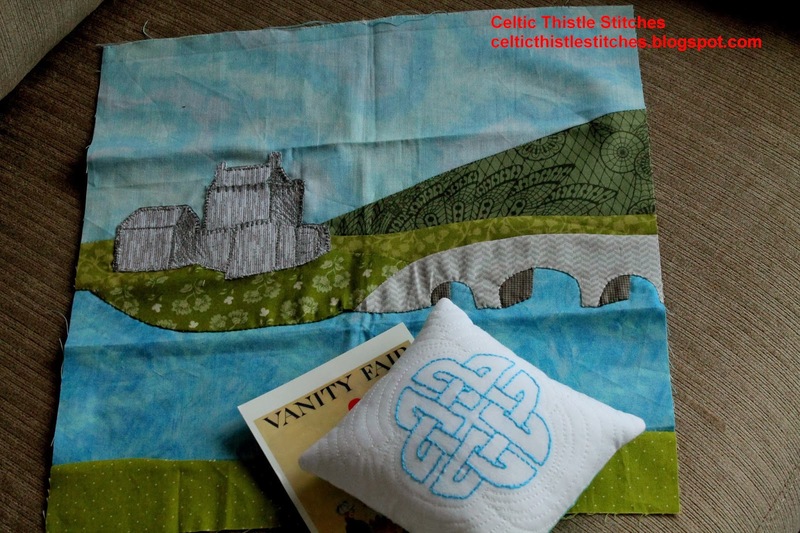 The Celtic Knotwork pincushion was an added treat! Thanks Nicky. I have at least one more block to make for the Star of Africa Bee and this has spurred me on to knuckle down and get the block done, hopefully, before the year ends. Another happy parcel arrived this morning and unlike the Bee block, this one was a complete surprise! Now isn't that a nice package to receive out of the blue! 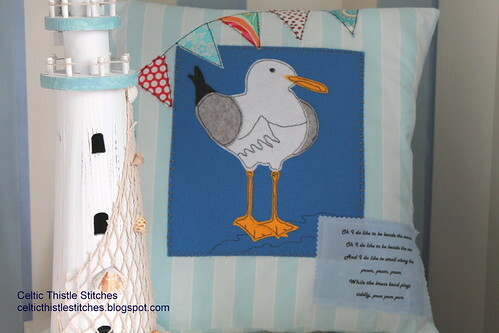 Ages ago I posted about this seagull cushion that I had made for a Blog Hop. In the comments, Pam at Threading My Way mentioned that her relative would love a cushion like this, so when I discovered that I had accidentally bought the cushion pattern twice, well it made perfect sense to send the spare copy to Pam. 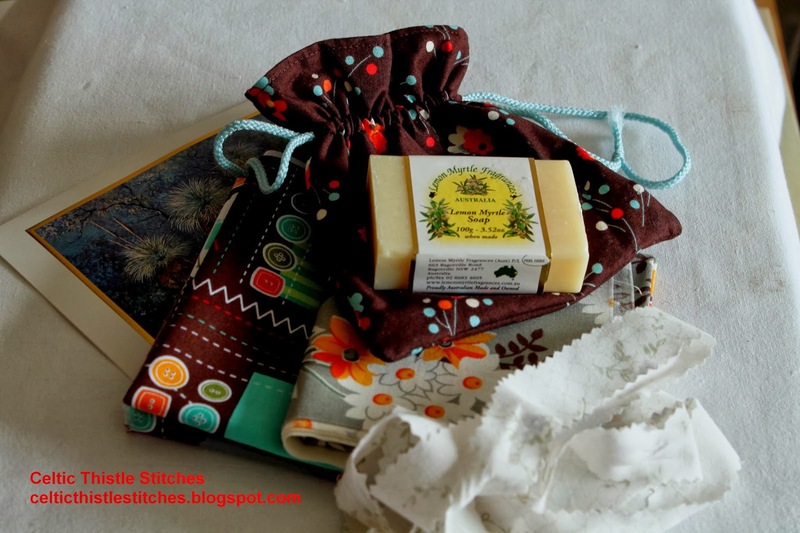 I thought no more about it, until the package arrived this morning with a note from Pam telling me that she hoped to have finished her cushion by the time the package arrived! Hope you are getting more than just bills through the post too! What great post. I especially love that block from nicky. Amazing work. Lots of nice post! I love that block, I didn't even realise it was sewn at first, thought it was a stylised drawing! Love getting nice mail! =) Look like you really had a great week! Awesome! Isn't it lovely to have such a nice postman?! the block from Nicky is amazing. Nice surprises in the post for you Christmas come early! The castle block looks painted... awesome!!! Looking forward to making up the cushion, Fiona! Thanks Rose, I was delighted when I found it, it will be perfect for my son's pyjamas! Wow! The African Star block you got is fantastic. And I love the seagull cushion - extra fun pic, because we have that exact same lighthouse piece!